my scheduled trip to cotabato city yesterday was canceled due to "security reasons", and this at least gives me some form of respite from having traveled by air in and out of manila for successive weeks. as i've said in an earlier entry, this last fiscal year, ending march 2008, has been my most mobile thus far, at least in so far as flying is concerned. but it does not help of course that you have to leave manila in an airport terminal beset with delays, lack of comfort, and a generally unfortunate vibe about it. 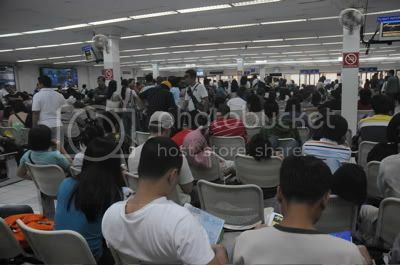 last friday, there were not enough seats in the waiting area; the people standing in the picture below are not queuing to board. they have nowhere to rest their bottoms! are there actually plans to upgrade the domestic airport, so i can at least hold on to this fantasy, just as i do about a future world-class DMIA, or if the forces allow, the upcoming opening of T3? something has to be done with our gateways. 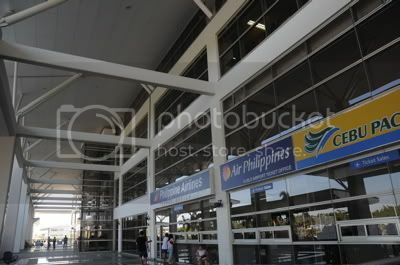 the NAIA 2 is an impressive little terminal, but its predecessor is in such a sorry state i find it rather embarrassing! but will all these plans matter, or are they bound to end up like london's T5? Changi's T3 is the glass terminal? I guess I used T2--- the one with orchids in it. 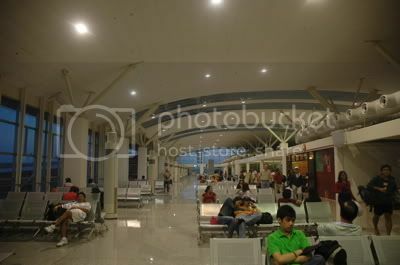 about NAIA's T3, yes, i do hope they open it up SOON. Every time i arrive from the states, i have this feeling that there are about 3 planes landing almost 5 minutes apart... and coming to the immigration area, there aren't just enough counters. Kahoy pa ang counters. yun lang. hassle and nakakaawa. mangarap ng magandang bukas? bukas seems to be forever to me. there is a great need for us to be a rational society.